South Korean actress, Ha Ji Won (하지원) attended the 2013 MBC Drama Awards held at MBC Building in Yeouido, South Korea on December 30, 2013. The actress wore a white gown with embellished cap-sleeves from British label, Jenny Packham Bridal 2013 collection. Black embroidered clutch from 21DEFAYE and stunning Cartier jewels to complement her gown. I fell in love with the blush pink runway version of the dress when Dita von Teese first wore it during 2012 Oscar season. 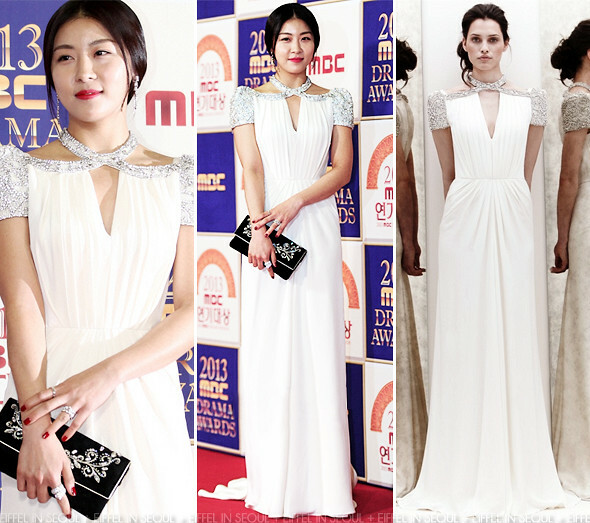 The Korean actress looked lovely in the gown. However, her hairstyle seemed a little flat. Ha Ji Won looks stunning. Really beautiful gown. Her hairstyle was perfect, and she made the dress look more beautiful than it really is! It looked better on her, than on the runway, or on Dita von Teese, in my opinion.